When UGA graduate student applicants were surveyed as to where they heard about UGA, faculty were listed as the 2nd most common source. Potential students are very interested in and value connecting with faculty from their area of interest. This page lists recruitment information specifically for faculty. The Graduate School offers financial assistance to departments in the form of Recruitment Enhancement Grants that provide funds directly to support recruitment efforts. This is a proposal driven process in which departments individually develop, implement, and assess strategic recruitment plans. If awarded, the funds can be used to pay for a variety of recruitment endeavors including but not limited to bringing students to campus, hosting an Open House, paying for registration fees and travel to graduate recruitment fairs, and the creation of marketing materials, to name a few. The call for proposals is announced early in the fall semester. As you know, interaction with faculty members can be a great recruitment tool for your department and for the Graduate School as a whole. Whether you are going to give a lecture or research talk or visiting another university to recruit students for your department, the Graduate School can provide information and materials to take with you. Please email grecruit@uga.edu for more information. CollegeNET’s Prospect CRM is a centralized system used by the Graduate School that enables graduate programs to store information on prospective applicants for recruitment purposes, send strategic and synchronized email communications, track prospective applicants as they move through the recruitment funnel, and assist graduate programs in the assessment of recruitment efforts. 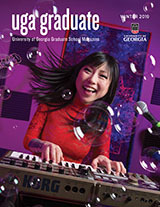 To gain user access to Propsect, please contact Dr. Lisa Sperling at sperling@uga.edu. In order to access Recruitment Resources, you need to log in with your UGA MyID.